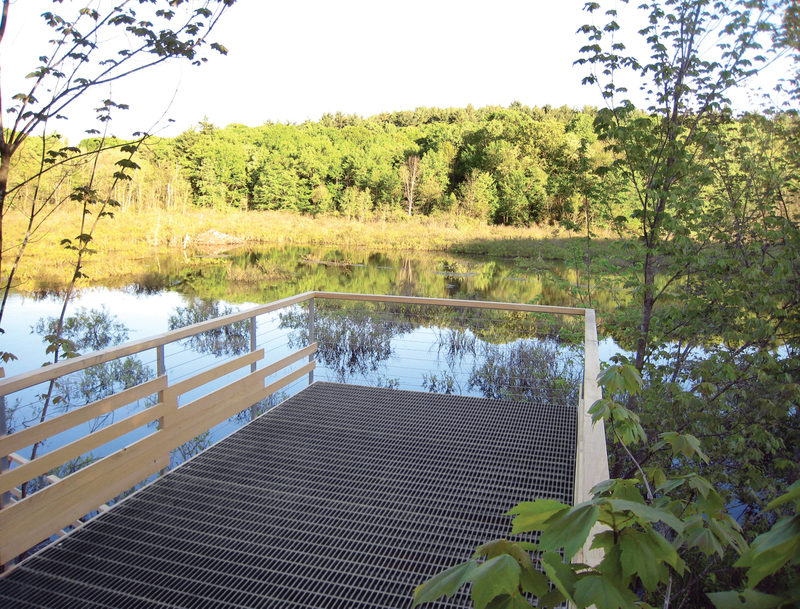 Connecticut birders happily swap their waterlogged Wellies and foggy field glass for the Wesleyan student–designed SplitFrame, a viewing platform in a former cranberry bog. At many construction sites, it’s weather that causes the biggest delays. In Portland, Connecticut, where a group of Wesleyan University students were tasked with erecting an observation platform in a fallow cranberry bog, the antagonist was a most prodigious design-build outfit: a colony of beavers. 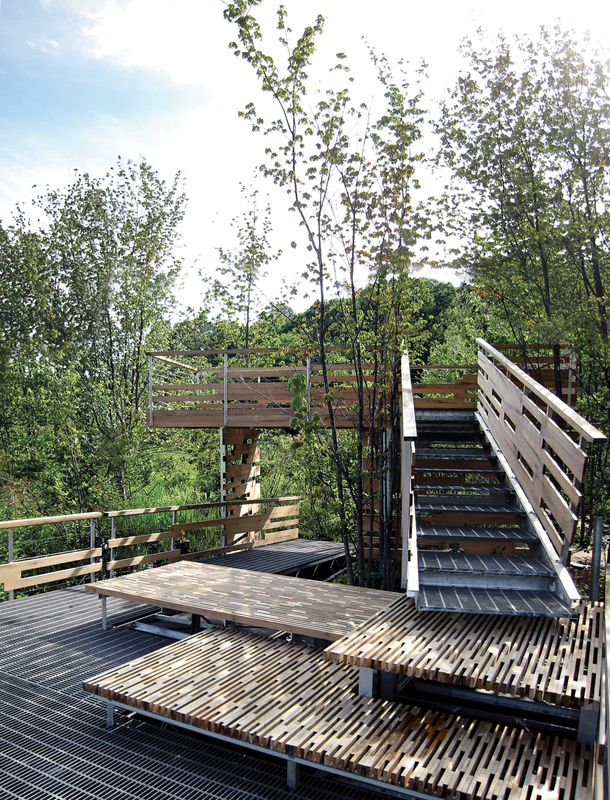 In January 2008, the Mattabeseck Audubon Society commissioned professor Elijah Huge’s architecture studio class to design and build an observatory at its Helen Carlson Wildlife Sanctuary. The goal was to accommodate everyday birders as well as the society’s elementary school outreach programs. Most importantly, though, the platform needed to protect the ecological integrity of the sanctuary, including the competing contractors across the pond—–the beavers—–who did everything in their power to keep the water level high, creating a bedraggled building site. To tackle the project, Huge split his 13 students into teams that were then recombined and regrouped throughout the semester. The teams traded models and riffed on one another’s work. The resulting design features a lower deck connected to an upper deck by a staircase that is hinged at the top and has rollers at the bottom to allow the structure to move seamlessly with the fluctuating water levels. the foundation footings by breaking up the beaver dam in the sluiceway—–a nearly Sisyphean effort, as the dam would often be completely rebuilt by the next day. Eventually the water level was low enough for the team to erect the six precast diamond-shaped piers. The area had already been neatly cleared by the beavers, but the minimal base allowed the students to save all but one tree. The other building components were floated out and pieced together on-site. The finished observatory is located off one of the artificial berms formerly used for cranberry cultivation, employing the landmass as a natural access point from the periphery of the wetlands. The decks capitalize on views at both the water and the canopy lines, and the transparency of the resin grating underfoot allows sunlight to pass through the structure, encouraging the growth of flora and fauna below. The observatory, which the students dubbed SplitFrame, has since endured its first New England winter and is holding up well. If the number of folding chairs set up along the upper-level deck is any indication, it is being put to good use by birders and their ilk. It is a place to experience wildlife without disrupting it. The birds go about their daily habits unmolested, and the beavers, too, are now happily minding their own dam business.